Without an efficient (SCM) supply chain management function, establishments across industries face roadblocks. As a result, supply chain management is considered as a comprehensive process that starts from the raw materials and inbound logistics all the way to the outbound logistics and putting down the idea on a table. Furthermore, SCM is crucial to an organization’s success and customer satisfaction as it embraces all the activities that lead to the success of the entire organization. This includes planning, operations, transport, inventory management, warehouse management, and marketing operations of service providers, suppliers, and clients. Information Workflow: Information circulation and sharing is what really keeps all functions of supply chain management on track. Purchasing: refers to obtaining raw materials and resources to manufacture the end products. Resource Management: decides the allocation of resources in the right time to enhance production at reduced costs. Operations: involves in demand planning and forecasting. Additionally, an organization must anticipate the possible market demand and the number of units it needs to produce. Logistics: is a function of supply chain that necessitates immense coordination. This is where the manufacturing of products has started. SpendEdge provides actionable insights utilizing lean methodology to help establishments make better purchasing decisions. Our procurement market intelligence solutions assist industries in meticulously monitoring the supply market settings and understand the importance of supply chain management. 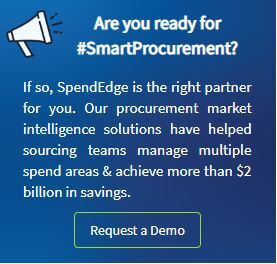 Moreover, every business needs smart procurement intelligence to stay at the top of their game.